EAST NORTHPORT, Long Island (WABC) -- A ceremony was held at a park on Long Island Saturday to remember an NYPD officer who was killed in the line of duty. Members of the Commack Fire Department gathered to pay tribute to Officer Charles Oddo, who died in 1996 while assigned to NYPD Highway 2. Authorities said Officer Oddo was struck by a drunk driver while directing traffic away from a disabled motorist. 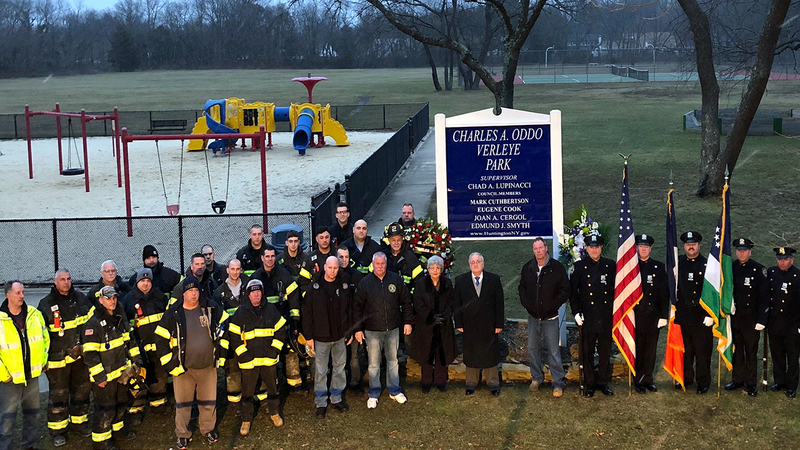 Firefighters gathered at the park named in his honor in East Northport, Charles A. Oddo Verleye Park. His parents also attended the ceremony. Officer Oddo was an East Northport native and a member of the Commack Fire Department.